Everyone gets excited for the New Year and a fresh start but usually by now people start going back to their not so good habits and normal routine. We are here to give you some of the top health trends happening this year to get you back on track. Hopefully one or some of these will grab your attention, so you can start integrating them into your life. Here’s to a healthy and happy, rest of 2018! 1. Moringa is on the rise! Moringa is known to fight inflammation and also has twice the amount of protein and three times more iron than spinach. It has large amounts of calcium, potassium, and vitamin a. Surely something so nutritious and healthy must not taste good, right? Fortunately not. 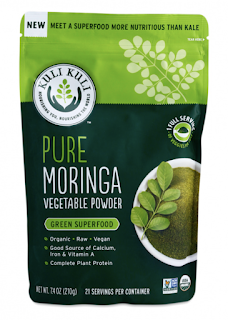 Moringa tastes delicious, which means that the food industry is rushing to capitalize on it. 2. Everyone is Coo Coo for Kombucha! Stomach health is usually not the first area people focus on fixing, until there is an obvious issue. An unhealthy gut can cause many health problems including arthritis, hair loss and even mental disorders like depression. Kombucha can help heal the gut naturally and has been trending this year. So how does it work?! Kombucha is a fermented drink, usually made with black tea and natural sugars. The fermentation process creates a healthy bacteria, known as probiotics, which can help line your digestive tract and support your immune system. To reap the full benefits of this powerful ingredient you should aim to drink it once a day but be sure to try it out first before committing to one a day. 3. Self Care is not a luxury, it’s a necessity! This year is about looking at your health on a deeper level and taking the time to care for it. It’s about finding balance and about making healthier choices when you see your self getting maxed out. There are many ways to do this, from regular journaling, meditation and walking, to eating cleaner and living a toxic-free lifestyle. 4. Skin-care products that help guard us against UV Rays, Pollutants, and Technology are trending! These days your skin is regularly exposed to blue lights from electronics, UV rays, and pollutants. Skincare products are now coming out with ingredients like lipids, ceramides, live bacteria and adaptogens to combat the effects of these. Jump on this bandwagon and look great while also blocking out those negative effects. 5. Stand up for good health! Standing desks increased in 2017, and 2018 is seeing even more standing trends. Prolonged periods of sitting are bad for your health; therefore, expect to see more “standing” opportunities at work, in waiting rooms, and even at home.